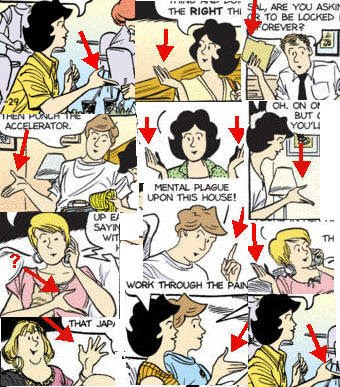 What's the deal with Sally Forth? Can't any of these characters say anything without adding in an annoying mannequin-like hand motion? If I always jammed my hand out at people while I was talking (which normally translates to "I'm right about what I am saying here, you dummy"), I'd probably get rightfully slapped by my wife and co-workers. No wonder Ted keeps this weird relationship going on with Aria at the office. He's sick of Sally's hand being in his face for the last 27 years. It's the same thing that we all saw happen with Jon and Kate!!! How many times can they use Sally's mother to bring tension into the other-wise normal lives of Sally and Ted? (This storyline rotates with Hilary's softball team, her goth friend, and Sally's immature sister. Nothing else appears to ever happen.) This has been going on for years and years. They just need to push Sally's mom down the basement stairs and be done with it.